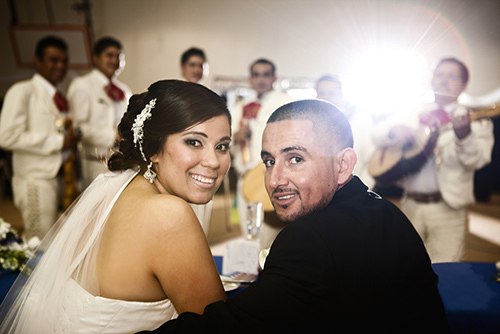 Weddings commemorate the union of not just two people and not just two families, but sometimes two cultures. And this theme of union is common to many different cultures. And yet, different cultures have different ways of expressing the same things. How are wedding traditions different by culture? In many different ways and we will go over it. Nowadays, people marrying others of different cultures. Combining different cultural traditions can be a great way to share common ties. 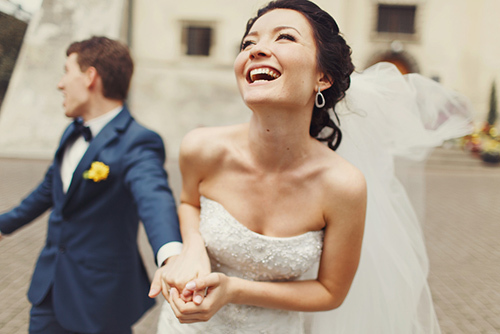 So here are 18 different types of wedding traditions by culture. Use this so you can think how to incorporate your spouse’s traditions or your own traditions into your own wedding and create your own wedding traditions! Whether you are African have African roots, here are some African traditions that you can incorporate. First off, I know what you are thinking. Africa is a continent, not a country. However there are so many different cultures and nations within Africa that it simply isn’t possible to go through each one. So we’ll go through some traditions, mostly out of West Africa that are commonly incorporated into North American wedding traditions between spouses of African descent. One Ghanaian tradition is the knocking on the door ceremony. While technically, this is a proposal tradition, it symbolizes the bride’s family accepting the groom’s family. The groom asks for the bride’s hand by knocking on the door of the bride’s family’s home. If the bride’s family accepts the knock, the couple is officially engaged and both families celebrate. One other ceremony which can be incorporated into this is the eating of kola nuts afterward. Kola nuts are thought to have healing properties and are a symbol of hospitality common to many West African cultures. Another great tradition to bring is the Yoruban tradition of “tasting the four elements”. The four flavors present at the wedding represent different emotions in a relationship. Typically the four flavors are sour, bitter, hot, and sweet. Anyone married can relate to all those emotions ;). But ultimately, you end with sweetness because that is the underlying emotion of a marriage, the happy union of two individuals and two families. Armenian culture is ancient, going back thousands of years and their traditions reflect that longevity. One custom the day of the wedding is the bride will take her veil and circle it over the heads of her single friends. This is to bring them luck in finding a husband. This sounds somewhat similar to the throwing of the bouquet. Armenian brides typically wear a red silk gown and a cardboard headpiece. The headpiece is shaped like wings and on top of the headpiece are many feathers. At the reception, traditional foods are served such as bourek, kabobs, hummus, and baba ghanoush. Chinese traditions go back thousands of years. Nowadays, many contemporary Chinese wedding traditions have dispensed with some of the more ancient things, leaving couples with the options of what to pick and choose. One interesting custom is the selection of the wedding date. The groom’s family asks a fortune teller to choose the wedding date based on the astrological calendar. The fortune teller then tells the family when would be the most auspicious time to get married. In terms of dress, the bride dresses in a red skirt. Red symbolizes delight. The groom also would dress in a red gown. Once the bride and groom arrive at the venue, loud music plays with firecrackers going off. Time to get that wedding off to a bang! The Dutch are known for clogs and tulips. And while these are great for incorporating into your own wedding traditions, one really romantic custom less known is the “wish tree”. At the reception, the bride and groom are placed near this “wish tree”. The guests have paper leaves with colorful ribbons attached. Guests leave notes and well wishes to the bride and groom on these paper leaves, which the bride and groom read and tie to the wish tree. 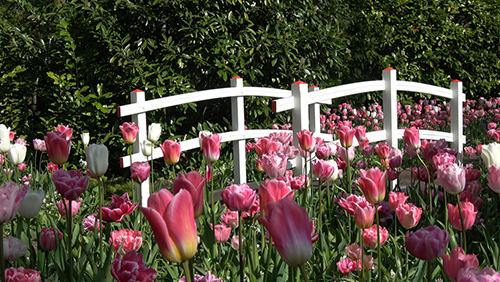 Flowers play a very important role in Dutch wedding traditions, . Before the ceremony, the bridesmaids fill the bride’s basket with flowers and green garlands. Additionally, the bride and groom walk down the aisle to the altar on a bed of flowers while flowers while the guests toss flowers at them. In terms of food, lots of sweets and heavy foods are served! These include sweetmeats, marzipan, and spiced wine. 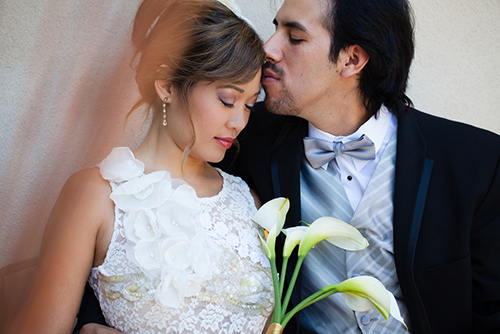 Filipino weddings are heavily wrapped up in Catholic tradition. And with that tradition comes the strong belief that marriage is a sacrament and something to be celebrated heavily. A typical Filipino wedding will therefore be larger than others, between 250 and 500 people can attend. Wedding parties can be large also, between 30 and 50 people. But what does this mean for guests? Party time! There is a lot of alcohol, food, and dancing. One traditional type of food is lechón, a Filipino dish of roasted pork. And in terms of customs, guests will pin money onto the sashes of the dancing couple. If you are a guest at a Filipino wedding, get ready to party well into the night! One of the main attractions of a French wedding can, not surprisingly, be the dessert. One traditional dessert is the croquembouche. This can be a replacement for a tiered wedding cake. Rather, it is tiered puff pastry filled with vanilla cream. It’s essentially a bakery pyramid. To make this ceremony even cooler, the way of cutting the croquembouche is with a sword! One regional tradition in the Vendee is a special dance called la danse de la brioche (“the dance of the brioche”). The brioche in question weighs sometimes more than 20 lbs. The bride, groom, and guests hold this giant brioche as the couple dances to demonstrate strength. Going back to sweets, another tradition is called dragées. Dragées are little candy wrapped almonds and they are handed out as wedding favors to the guests. Some French couples prefer other types of favors other than almonds but the theme is generally some small bite sized sweet treat. German weddings and the events leading up to them may seem well, let’s say, different to people of other cultures. Let’s start with polterabend which literally means “eve of making a racket”. In this tradition, which is the night before the wedding, the couple throws a big party where the guests throw porcelain everywhere. At the wedding itself, there are many games. One of them is called Baumstamm sägen (sawing a tree). And what’s the point of this tradition? Conquering a challenge together and what better challenge than sawing a tree together? One interesting tradition that is outside the general Western convention is that engagement rings are not too important before the wedding. And after the wedding, the rings are worn by both the bride and the groom on the right hand as opposed to the left. Greek weddings are the things of legends (and pop culture), probably because of films like My Big Fat Greek Wedding. The ceremony has much to do with the Greek Orthodox tradition. At the ceremony, there is a distinctive crowning tradition. The priest places the crowns, known as the stefana in Greek, one on the groom and one on the bride. They are made out of white flowers and evergreen leaves which symbolize fertility. In terms of the wedding dress, remember that the Greeks are an ancient people and they loved celebrating beauty and athleticism as part of Hellenistic culture. The dresses are therefore fairly form fitting, suggesting the sensuality of the gods of the Greek pantheon. The theme of the beautiful goddess persists to this day. 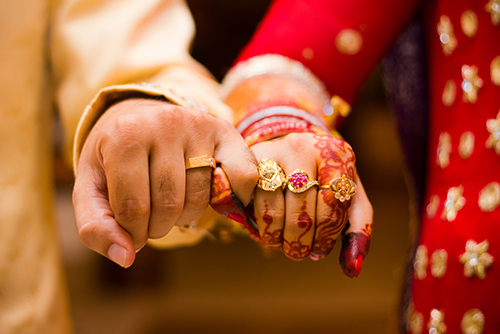 Similar to other faith traditions, marriage is a very important institution dating back to Vedic times. One of the more apparent traditions is the distinctive clothing. The bridal dress is known as a sari. The hair is in a bun and covered with a crown and veil. The groom whereas a dhoti, a garment which is unstitched. Other accoutrements are optional such as the white suit, sword and turban, and the safa. In one of the key aspects of the wedding, known as Jaimala, the bride and groom exchange garlands. The symbolism here is that the two accept one another and agree to respect each other. One theme throughout Hindu weddings is that of fire. The lighting of the sacred fire is known as Havan. Rice is offered to the sacred fire and couple walks around the sacred fire as well. Irish weddings are wrapped up in Celtic tradition. One such tradition is handfasting, where the hands of the bride and the groom are tied together. This symbolizes the union of the new couple and turns out to be the origin of the phrase, “tying the knot”! In terms of the cake, the Irish wedding cake is a fruitcake made with honey and soaked with Irish whiskey. Although green is usually associated with Ireland, blue is the color that the bride usually wears to bring good luck to her on her wedding day. Irish weddings also incorporate an old tradition passed from mother to daughter, that of the claddagh ring. 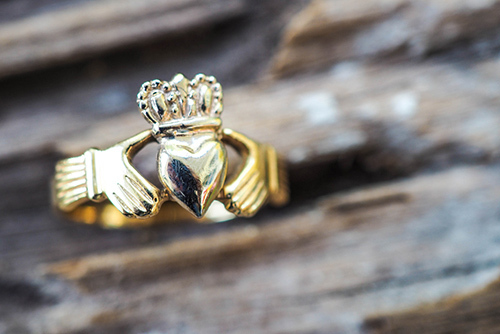 The claddagh ring is a ring with the image of a heart and a crown. Women wear the ring after it gets passed down from the mother but the ring moves over to the left hand when she is engaged. 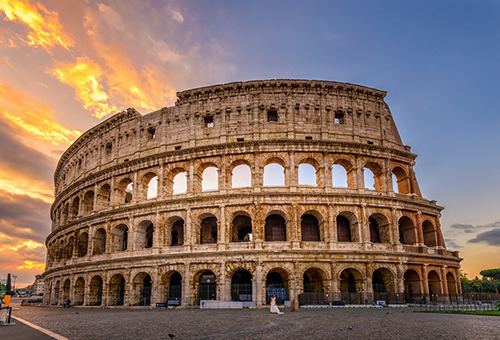 Some traditions of Italian weddings go back to ancient Rome. For instance, the bridal veil was to prevent the bride and groom from seeing one another before the wedding. This was to prevent a runaway bride or groom situation. The date of Italian weddings is very important. Sunday is considered the best day as Sunday symbolizes luck, fertility, and prosperity. One of the worst days to get married is a Tuesday (in Italian, Martedi, the day of Mars, the god of war). Marrying on a Tuesday meant you were going to spend the whole marriage fighting. Another tradition has it that the bride and groom break a vase and the number of fragments will amount to the number of years the couple has ahead. The more fragments the better! 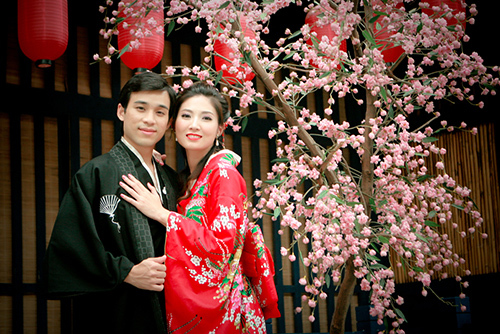 Many modern day Japanese weddings incorporate both ancient Japanese and Western elements. Traditionally, Japanese weddings are done in the Shinto tradition at a shrine. These days, the Shinto priest conducts the ceremony from a shrine or from a venue such as a hotel. During the ceremony, both the bride and the groom are dressed in the traditional kimono. A central theme of the ceremony is purification. The bride and groom purify themselves for the new union. As part of this as well, the couple will drink sake, a traditional rice wine. Jewish weddings mix formalities with fun. The wedding generally begins with a tish, meaning table, where the ketubah (or marriage contract) is signed in front of witnesses. The ceremony is held underneath a chuppah (or wedding canopy), symbolizing the Jewish home that the family is about to create. Under the chuppah, the groom will place the wedding ring on the bride’s finger. 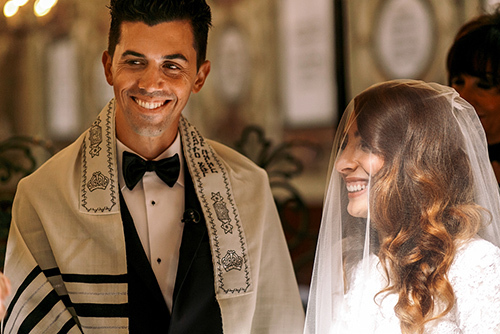 Traditionally, Jewish brides did not place a ring on the husband’s finger but in more liberal circles such as Reform Judaism, that has changed. After some other blessings, the groom smashes a glass with his foot. This custom has become quite famous and is supposed to be a solemn moment commemorating the exile of the Jewish people. Even in interfaith ceremonies where a Jewish bride or groom marries a non-Jewish spouse, many times this act of smashing the glass is still carried out. Korean weddings are apparently easy to plan due to the industry being built around speed and convenience. Weddings are supposed to be short and to the point. There aren’t bridesmaids, flower girls, ring bearers, or groomsmen. The whole process is approximately a 2 hour affair. The ceremony is called pyebaek which is only for family members. 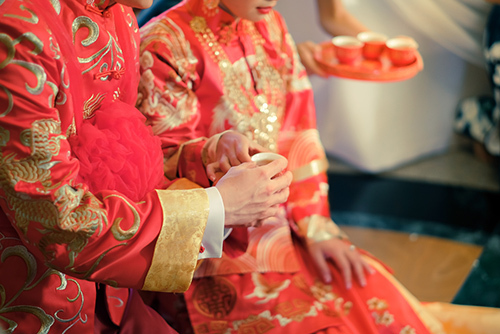 While the bride and groom will wear special clothing called hanbok, guests generally do not. Some of the traditional foods that are served are chestnuts, jujubes, and dried persimmons. So what’s the purpose of the ceremony? To bless the newlywed couple and wish them many sons and daughters! Similar to African weddings, Latin America covers multiple countries so getting all the customs down is just not possible. But there are enough similarities. Firstly, most ceremonies are held in a Catholic Church. Like other traditions, the reception starts late so all guests will want to pace themselves. Then the fun begins, especially cotillon. This is the part where the bride and groom come back with costumes, funny hats, and other weird items for people to take photos. Very commonly the father-daughter dance song is Mi Nina Bonita. And instead of the bouquet, a crowd of single women gather around the cake which has ribbons attached. One of the ribbons has a ring. Whoever pulls on the ribbon with the ring is the next to get married! Let’s get the first element out of the way: yes, there is a wedding kilt and no that’s not the only tradition Scots have at their weddings. As far as traditional gifts, the best man generally gives the couple a clock while the maid of honor gifts a tea set. The walk to the church where the wedding is traditionally performed is called The Wedding Walk. The couple is preceded by a piper or a fiddler. After the ceremony, it is considered good luck for the couple to cross running water twice. At the reception, the first dance is called The Traditional Grand March and involves the bagpipes and a live band. Spanish weddings are large with at least 200 guests. One of the customs is known as arras where the groom presents the bride with 13 coins. This shows the groom’s promise to support the bride. However, in contemporary Spanish weddings, brides and grooms will exchange coins with each other to show that finances will be shared equally and it’s not just the groom’s job. One interesting custom is cutting up the groom’s tie into fragments and auctioning off each piece. Who would buy a piece of a tie? Well, each piece represents good luck so buy away! For Vietnamese weddings, dates are very important. Traditionally, weddings occurred during the fieldwork season so weddings would occur in winter or fall months. Fortune tellers are additionally consulted for the most auspicious dates for marriage. For gifts, the more the better. The larger the gift, the more wealth it shows. However many gifts are given, they are covered by red paper or cloth which symbolizes bringing luck to the couple. 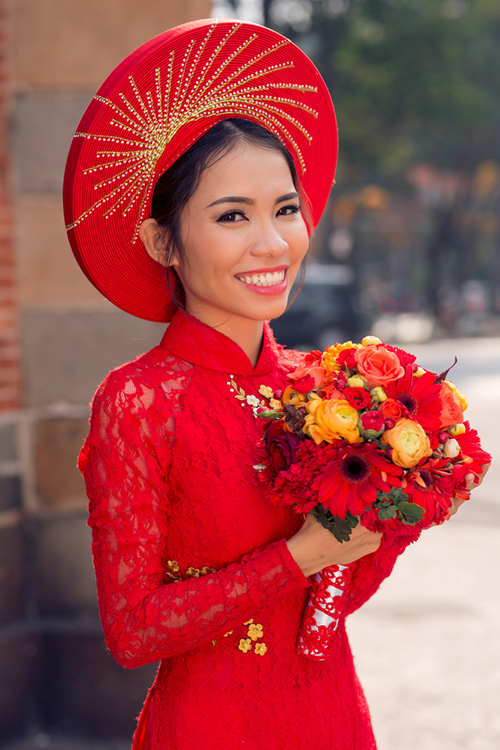 In terms of dress, the bride generally wears a pink or red dress called an ao dai. The groom’s clothing is blue. So there you have 18 cultural traditions from around the world. If you belong to one of these cultural traditions, it is up to you and your family how much you incorporate. 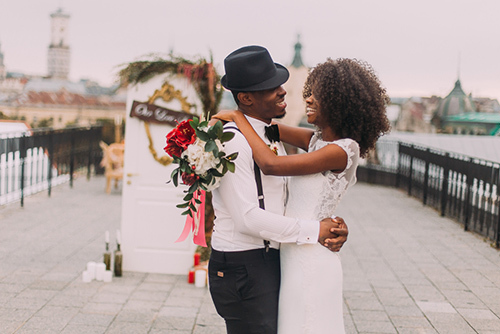 What’s great today is that with so many intercultural and interracial couples, there is a lot of opportunity to bring traditions from two or more cultures into one wedding. And it wasn’t so long ago that many countries had miscegenation laws which prevented such unions. So we should be happy we live in a time where all this cross cultural contact can happen in the name of love! Let us know about some of your culture’s wedding traditions and customs in the comments below!